Red and black are not always going to match up like that. I'm pretty surprised the instructions even mention matching colors. There are conventions, but it's not very reliable in practice other than white always being neutral and green/bare being ground. You need to read the instructions on your smart switch, and you will find that red or black is going to be for power (line) and the other is going to be for the light (load). 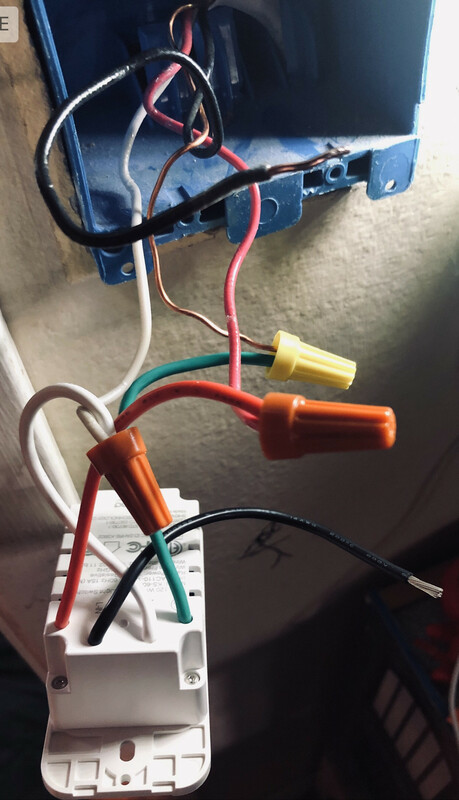 Since it's not working the way you have it hooked up, I would assume red and black need to be swapped, but before you ruin the switch, read the instructions and determine if the red or black wire in the wall are hot (line voltage). More explanation: On a regular switch, what wires are hooked up to the two screws doesn't matter because it's a simple contact closing and the electricity will flow either way. On the smart switch, it needs power on a particular wire to control the electronics. So, the hot wire from the wall must be connected to that particular wire on the switch and the load (light) gets hooked to the other wire. Not the answer you're looking for? Browse other questions tagged electrical switch or ask your own question.